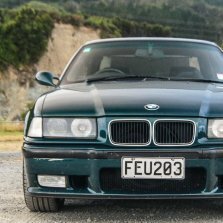 Hi Andy, with your help from another post, I set out with the intention of getting E36 M3 evo gear but it's obviously few and far between. So I went with xyz coilovers and stayed down the 4x100 route. I wasn't worried about the brake setup on 4x100, more the crap selection of nice wheels available. 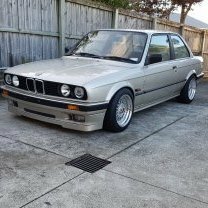 Long story short, suspension setup is oem apart from coilovers made for the e30 and a Z3 rack. If you interpret my comments as advice not to get a cert (and that's a reasonable interpretation) then fair call, I'll cop that it's not good advice. Nevertheless, I think some things unnecessarily require a cert as a result of deliberately broad certification language. Adjustable front camber plates, even from a reputable supplier, require a cert... heck, even the reinforcements I've had welded (added!) to my sway bar mounts require a cert if you take the requirements literally... until I'd looked it up I wouldn't have thought an OEM steering rack that didn't change geometry would require certification... apparently it does but only because the language is vague, not because it's a genuine safety concern. The cert requirement for a replacement rack seems to be a) bump steer test, b) confirmation of no geometry changes and c) steering column modifications are structurally sound. There's a prescribed method for the bump steer test so overall it should be easy to pass if you've done a good job using an OEM rack. My comments about throw and rack stops do NOT relate to mounting the rack. If you use the proper (throw/range) rack stops then you'll avoid the possibility of "folding" the wheels (we're talking mm's not inches). As far as spacing the rack on the subframe is concerned I'd never recommend that unless it was vertical spacing only and using solid hardware. Moving the rack left/right or fore/aft will change the geometry and is ill advised. As far as spacing the rack on the subframe is concerned I'd never recommend that unless it was vertical spacing only and using solid hardware. Moving the rack left/right or fore/aft will change the geometry and is ill advised. yes, vertically, as is required in the conversion. tangent but for what its worth, Im currently working in a body shop in Canada doing final inspections and detailing etc, where there are no annual inspections or anything. because of mah liberty mostly. almost every single car i have seen has had what would be a WOF fail. (seat covers over airbag equipped seats, chipped/cracked windscreens, and at least one bulb out if not more, and thats only looking at the things that the shops actually worked on/near, and not include the damage itself of course. and almost everything that comes in is less than 10 years old). in a country where litigation can ruin not only your life but that of your family, i imagine that it would be much worse in NZ where that is not the case. The other way to look at it is of course that perhaps the WOF rules in NZ are too strict, and there is some merit in that, certainly in some places. but again, its for the lowest common denominator. But do people die because of it here? thats hard to say. Can anyone else confirm this works? Have seen a couple of people mention it. Makes the job easier if you don't have to mess around venting the E36 rack ends. Yes, they work, just slightly less toe adjustment because they're longer. I had my e36 rack swap picked up during certify. Because the rack needs to be spaced and lowering, the steering geometry had changed (nothing to do with 5 stud swapping) ended up having to go through a full bum steer test and have adjustable rack ends made to correct the bumpsteer and put the steering arms in a positive position. Also had to weld the spacers in so they couldnt be removed. I know that safety is the highest priority, but that just seems like over kill. Surely a comparison between the oem and new rack would show not alot of difference. I'm just trying to think if the rack casing is an ali alloy or not, other wise I'll have to have steel spacers made as opposed to the ali ones my mate made me. I wonder if these kits would work for bump steer. Also @WYZEUP, what does the bump steer test cost? Depends on how much work he needs to do, but mine cost $250. Have spoken to a couple of people recent who have drilled the spindles and run heim joints and spacers to adjust the bumpsteer. Need to be drilled otherwise need the conical pins machined. Beware of buying the pre-made kits as they may not have enough adjustability, like the ones I bought.